Welcome to "Hodogaya Chiku Center". Hodogaya Chiku Center is a facility that anyone can easily use for the activities such as culture, sports and learning. 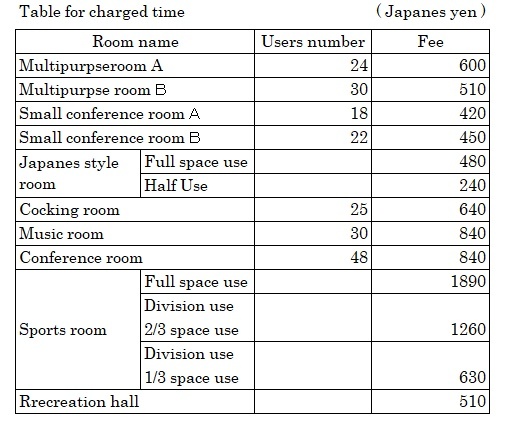 There are places suitable for activities of a wide range of years, such as Conference room, Japanese style room, Cooking room, Music room, Craft room, Playroom for children, Entertainment corner, Library, Sports room. Regarding the Sports room and Recreation hall, we have free time that you can enjoy badminton and Table tennis without making a reservation. At free time, please bring badminton tools and shoes. Table tennis too. You cannot play ball games such as baskets ball at free time. Please see the table below for free time. Charged time is the table below. Copyright(C) ほどがや地区センター All Right Reserved.